The Arizona Diamondbacks opted to strengthen a strength when they acquired relievers Brad Ziegler, an old favorite and a member of their 20th anniversary team, and Jake Diekman at the July 31 trading deadline. Arizona still leads the National League and is second in the majors to the New York Yankees in bullpen ERA, with left-hander Diekman and submariner Ziegler working right in. The San Francisco Giants, meanwhile, found another high-leverage bullpen piece in rookie right-hander Ray Black, whose made his ninth straight hitless appearance while getting his first hold of the year Thursday. He hit 99 mph on the radar gun. Black has 13 strikeouts against five walks in his last nine outings covering 9 1/3 innings. After being touched for a three-run homer by Matt Carpenter in his major league debut on July 8, he has been untouched since. [post_ads]"No problem using him in the sixth, seventh, eighth," Giants manager Bruce Bochy told reporters. "He's in the mix with those other guys. What that allows you is to rest some of those guys. That's the luxury of having five or six guys you are comfortable with pitching high-leverage situations." Diamondbacks left-hander Robbie Ray (3-2) is to face Giants left-hander Derek Holland (5-8) in the final game of the series Sunday. "We've had a great bullpen all year," Arizona general manager Mike Hazen said after adding Ziegler and Diekman. "We've run them pretty hot, and as we get to the second half of the year we want to make sure they stay pretty fresh. As you go through a full season, those innings end up piling up on you." Arizona setup man Archie Bradley and left-hander specialist Andrew Chafin have made 53 appearances, two behind Ziegler for the most in the NL. Setup man Yoshihisa Hirano has made 52 and closer Brad Boxberger has made 43, with 26 saves. Left-hander T.J. McFarland leads NL relievers with 63 1/3 innings. "Our starting pitching has been getting us pretty deep in games for the most part," Hazen said. "But when you look at Yoshi, 'Box,' Archie, 'Chafe,' they've taken the brunt of it here recently. That's what happens when you go down the stretch. "We wanted to give Torey as many options as we could to pitch in those games where if Yoshi needs a day or Archie needs a day, we feel like we are not missing anything." Lovullo has said he plans to keep Boxberger, Bradley and Hirano in their high-leverage roles but sees Ziegler and Diekman as high-leverage options. "I know that Brad will probably get some of those righties in close games, and Jake will get righties and lefties in some close games," Lovullo said. "They are going to be counted on down the stretch. They have pitched in big games." Ziegler had 10 saves with Miami this year before being replaced in that role and had good success in that spot in Arizona. He had 30 saves as its closer in 2015 and 18 before being traded to Boston (where Hazen and Lovullo) worked in early July 2016. "We think both of those guys can go a full inning, get through lefties and righties," Hazen said. "They do it a little differently. Brad puts the ball on the ground quite a bit. With Jake from the left side, it gives a little more of a power element to the bullpen. We wanted to add a little more power." Ziegler said, "I'm not looking to change anything. They have a good thing going. Just keep it rolling." Ray, who carries a 5.05 ERA, threw six scoreless innings in a 2-1 victory on June 27 at Miami in his return to the rotation after missing two months with an oblique injury, but has not won since. Ray was 0-2 with a 6.12 ERA in six starts in July and made only one quality start in that stretch, a no-decision against the Chicago Cubs at Wrigley Field in which he gave up one run and four hits in seven innings. In 66 innings, Ray has 87 strikeouts, a rate of 11.7 K's per nine innings, which is second to Max Scherzer (12.1) among NL pitchers with at least 1,100 pitches. Ray did not get a decision in two April starts against the Giants, giving up five runs and striking out 15 in 10 2/3 innings. He is 4-1 with a 2.84 ERA in 10 career starts against them. Ray has more victories against only one opponent, six against the Los Angeles Dodgers. He has been much better on the road this year, going 2-1 with a 2.57 ERA in seven starts. He is 1-1, 7.84 in six home outings. Holland (3.90 ERA) has faced the Diamondbacks three times but has no decisions against them while giving up seven earned runs in 13 2/3 innings. 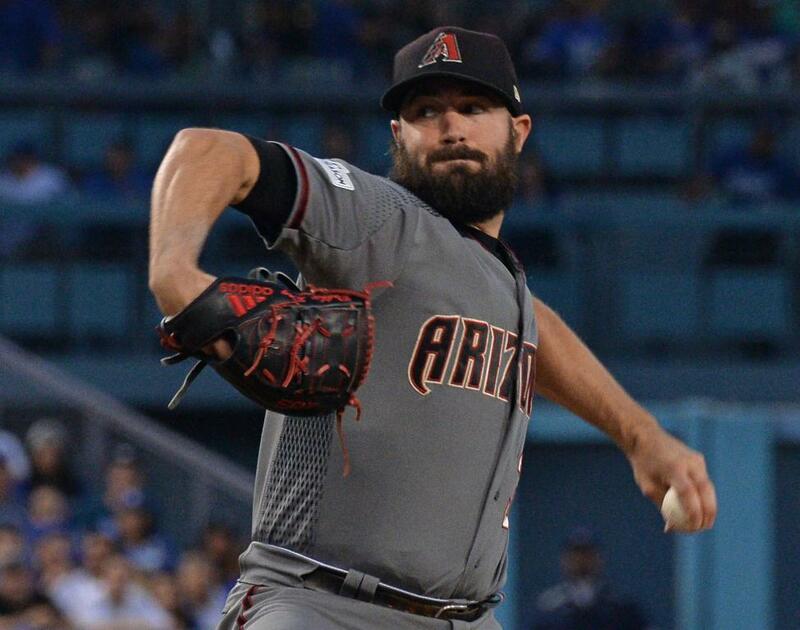 He was moved to the bullpen after giving up seven hits and three runs in 3 2/3 innings at Arizona on July 1, making four relief appearances, before returning to the rotation. Holland has given up three runs in 11 innings in recent starts against Seattle and San Diego but did not get a decision in either. His only career appearance at Chase Field came in the July 1 start. He is 3-5 with a 3.84 ERA on the road this season.